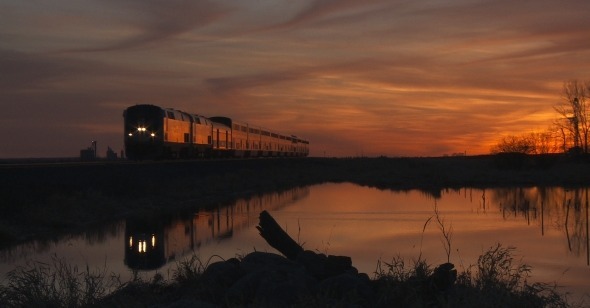 In Transit is the last film codirected by the late Albert Maysles. It enters the world under the distended authorship signature of five filmmakers—Maysles, Lynn True, David Usui, Nelson Walker III, and Benjamin Wu—most of whom are also credited here as editors, cinematographers, and producers. This level of creative inclusiveness has been part and parcel of Maysles’s practice throughout his career—there are only a handful of “Al Maysles” films that bear his name alone, including his first short, 1957’s Psychiatry in Russia, the 2013 short film The Secret of Trees, and his 2015 feature Iris. More often his director credit has been shared with the likes of Susan Froemke (LaLee’s Kin: The Legacy of Cotton, Letting Go: A Hospice Journey), Deborah Dickson (LaLee’s, Letting Go), Charlotte Zwerin (Gimme Shelter, Salesman), and, of course, his brother David. I profess to no inside knowledge of how these decisions have been worked out over time, but I’ve always just assumed that the filmmaker’s generous, inclusive spirit, which is quickly discernible from his easy way with his subjects, carried over to how he handled himself with his creative partners. This new work is one of the most expansive and inclusive Maysles has attached his name to, both in terms of geographical sweep and size of its cast. In Transit documents the Empire Builder line, established in 1929 by the Great Northern Railroad Company and managed by Amtrak since 1971, and the people who ride and work it. The line begins in Chicago, darts north into southern Wisconsin, ascends gradually northwest to Minneapolis and then into the Dakotas before cutting straight west through, first, the Badlands, then, later, Big Sky country, before terminating at a few different Pacific Northwest cities. Over the course of about three days, the Empire Builder traces, in large measure, the route taken by Lewis and Clark and Sacagawea in the early 1800s, which represented the first American exploration of its recent Louisiana Purchase acquisition. The significance of this route to the history of the United States is likely not lost on Maysles and company. Neither is the visual quality of the epic vistas the Empire Builder traverses—endless expanses more often heard of by most Americans than experienced firsthand. Of course this route was chosen for a reason. Or else this team of filmmakers might as well have saved money and time by attempting the same experiment on the bland confines of the Northeast Corridor. It must be some kind of cosmic alignment that the subject of the final film by Al Maysles—the poetry of trains—is the same as that of the first made by his brethren in Direct Cinema, D. A. Pennebaker, in Daybreak Express (1953). In Transit launches with a jolting kick: we see riders, overhear conversations taking place over seat backs and across aisles, track trains leaving stations. All seems in motion, and we are flush with that sense (illusory, always) that we are being offered privileged access to life as it’s being lived. The film proceeds almost as a round, picking up different riders, leaving them for a time, adding new passengers and returning back to watch some depart and new potential subjects board. Conversations recur but none of the featured subjects, thankfully, are constructed into characters, forced to endure the indignity of their lives being crammed into digestible arcs. Everyone we see says their piece, and eventually shuffles off to their ultimate destination. This vérité rush dims somewhat as the film settles and different riders begin speaking direct to camera, swatting at the fly on the wall. In Transit never fully abandons its observational mode for long, and though making space for testimonials puts it somewhat at odds with a (hopefully waning) contemporary documentary obsession, it enriches the work’s humanity. We hear story after story in which subjects betray more than they’d like about their class, race, personal successes, failures, and family before the company’s patient, gentle cameras. Through editing, light narrative tension mounts: a young, black girl travels home to Minneapolis to deliver her first child with the help of her family. She’s already several days overdue when she boards—will a stoppage just outside her destination lead her to give birth on the train? She strikes up a friendship along the route with an ailing older, white photographer taking his last trip across one of his favorite portions of the country. The connections that are found and forged between passengers throughout the film are heartening in the same way as Frederick Wiseman’s kaleidoscopic neighborhood tour In Jackson Heights. In Transit suggests what happens when Americans, raised to believe in equality, are made equal by sharing a train car together for several days. Divorced from the status-defining trappings of their everyday lives—jobs, neighborhoods, houses, cars—they have the chance to reckon with each other as, simply, people. And, at least from the evidence Maysles and company have gathered, most seem to relish the opportunity. The significance of the name Empire Builder was likely not lost on Maysles and his team: empires, especially of the modern capitalist variety, have proven especially adroit at exploiting divisions so as to fuel their rapacious expansion. Yet it is perhaps in this violence that we can locate the seeds of their undoing, points of resistance. James Benning’s great structural railroad film, RR, highlighted how the railroad, the driving engine of the Manifest Destiny project, left scars across the American landscape that ultimately healed into a new layer of connective tissue. As empires build, they bring the disparate together, and push peoples otherwise separated into proximity. The Empire Builder, as presented in In Transit, then becomes an optimistic microcosm. It’s proof that the American experiment’s still cranking along and being negotiated in the background of divisive and grotesque national discourse. It’s a simple, kind, skillfully made film that doesn’t mean to jerk tears from the viewer on any obvious level, but arriving as it does in the first half of 2017, it's a hopeful dispatch, arriving like a gift from the front lines where lives are lived.